Spacious and comfortable villa -3 bedrooms, 3 bathrooms- with stunning sea view. Some of the Patara resort amenities are: 4 swimming pools as well as tennis courts, bars, restaurants, health and fitness centre, shops, sea/water sports, and more! -	A private garden below the terrace planted with palm trees and bougainvillaea. -	Direct sea access, easily reachable on foot. Privacy and seclusion are key here. The villa is spacious, elegant and with beautiful sea views. The interior has been planned to preserve the luxury of space, keeping sleeping accommodation to the bedrooms. Upstairs two of the three bedrooms have the same wonderful views. The master bedroom has its own shower bathroom with WC. There is a second shower room with WC, en-suite to the second double bedroom which also boasts fabulous sea views. Downstairs, cool marble steps lead to the open-plan sitting room and dining room with large French windows opening onto the terrace. The large partly-shaded terrace has comfortable cane seating, as well as cane dining table and chairs where you can relax and enjoy the stunning view over the palm trees in the garden to the sea below - no other house between you and the Mediterranean. Steps from the terrace lead down to a private, open-fronted garden, perfect for relaxing. The kitchen is roomy and well-equipped, with marble worktop and plenty of cupboards, full-size cooker and extractor hood, dishwasher, fridge/freezer, toaster, electric kettle, and electric coffee-maker. In addition to the Patara Club swimming pools, there is easy access to the sea from the rocks just below the house (the water is blue-flagged for quality), where there are also several platforms with sun loungers and umbrellas. As well as all the swimming choices and water-skiing available directly in the resort, there are several bathing clubs around Kalkan Bay where you can swim from rocky platforms. Kalkan is a major diving centre, with several operators offering dives and PADI courses. If you feel the need of a long walk with sand between your toes, the 18 km long stretch of completely unspoilt beach at Patara, among the finest in the Mediterranean, is only 17 km away. Nearer is the dramatic setting of Kaputas beach a few kilometres east of Kalkan, while Kalkan itself has a small pebble beach. The villa is located in the village of Kalkan, beautifully set on one of the southernmost parts of the Turkish coast overlooking the Mediterranean Sea. The white-sand beaches of the area are backed by mountains clad with pine and olive trees, and there are many fascinating antiquities to explore. The resort is internationally renowned for its architectural style based on an ancient Lycian city. Natural stone walls, wooden verandas and dusky pink elevations have been engineered to blend into the surrounding landscape. The abundant gardens create an oasis of green and colourful blooms. A cobbled private road winds from the top of the development to the sea at the bottom. The villa has fantastic sea and Kalkan views and the resort has the benefit of a Blue Flag awarded sea front just metres away. Internally the property is characterised by its natural stone walls, marble cast floors and fireplaces. Kalkan is now a popular holiday destination, with the resort one of its best addresses. This delightful Mediterranean village-type resort, made of traditionally-built houses and a boutique hotel, clings to the hillside just across the bay from Kalkan harbour. The houses with terracotta-coloured walls and pantile roofs are set in lush gardens running down to the water's edge. This pedestrian resort is charming, with everything required for a stylish holiday. It offers several places to eat ranging from the highly romantic restaurant above the deep waters of Kalkan Bay to informal poolside bars, bakery and café, sea front barbecue and fine dining in the Agora. There are 4 swimming pools as well as tennis courts, (one of which is floodlit), bars, restaurants, health and fitness centre, shop and other amenities, while a water taxi operates across to Kalkan harbour during daylight hours for a still wider choice of restaurants and shopping. Private cars are not permitted within the secure, gated resort except for unloading and loading on arrival and departure, but a frequent free shuttle service operates through the resort up to the freshwater pool, tennis courts, shop, car park and helicopter pad. Since the village-resort is built on a steep hillside, there are many flights of steps making it unsuitable for the very young or less mobile. Largely untouched by mass development, this picturesque resort lies in a lovely bay and is a charming fusion of higgledy-piggledy old town, modern hotels and white-painted houses gathered around a pretty and lively harbour. Whitewashed houses, old wooden balconies bright with bougainvillea and narrow stone-paved streets all contribute to the charm of old Kalkan village. Kalkan is famed for its wonderful and varied selection of restaurants, from the fine cuisine combined with great views to be found at Aubergine, to the restaurants higher up in the village serving traditional local dishes at very reasonable prices. Kalkan is well-placed for excursions by bus, car or taxi to a number of classical sites such as Xanthos, Patara, Myra and Tlos, while from Kalkan or the picturesque town of Kas nearby you can also hire a gulet to explore the beautiful coast or take a cruise to Kekova with its underwater ruins, stopping en route to swim in isolated bays. Inland are high mountains and cedar forests to explore, with the Lycian Way offering numerous waymarked walks in the vicinity. There are superb wild flowers, at their best in March, April and early May. Insurance: Please note that, as with the majority of private villa rentals in Turkey, insurance is not included - all renters are advised to take out their own adequate travel insurance for the duration of their stay. Early spring is a beautiful time to visit Kalkan for a relaxing peaceful holiday away from the crowds, mid-March and April being the best months to explore the Lycian cost to see the abundance of historical and archaeological sites, catch up on your reading or simply relax and watch the world go by. The villa is shaded from the sun and is fronted by mature gardens so keeps cool in peak season heat for those who want to choose the height of the season. The air conditioning keeps the villa cool during hot peak season. Many people say that September is the best month of the year to visit, offering relief from the constant intense heat of July and August, but still warm enough to relax in bathing suits. October tends to bring cooler weather, but is still very pleasant, typically in the low 20s centigrade, and still good enough for eating out in the evenings. The nearest airports are at Dalaman (c. 1 ¾ hrs. drive) and Antalya (c. 4 hrs. drive). As well as direct scheduled flights, charter flights also operate year round from the UK to Dalaman. Airport Transfers: Transfers can be arranged from either Dalaman or Antalya by taxi or minibus. Alternatively you can rent a car at either of the airports. It is also possible to rent a vehicle once you arrive in the resort. Downstairs, steps lead to a very spacious open-plan sitting room and dining room. Three french windows open onto the terrace. The partly-shaded terrace has comfortable seating, as well as a dining table and chairs where you can relax and enjoy the uninterrupted view over the palm trees in the garden to the sea below. Steps from the terrace lead down to a private, open-fronted area, perfect for relaxing. The kitchen is well-equipped, with plenty of cupboard space, full-size cooker and extractor, dishwasher, fridge, freezer, toaster, kettle, and coffee-maker. In addition to the swimming pools, there is direct sea access from the rocks just below the house (the water is blue-flagged for quality), where there are several platforms with sun loungers and umbrellas. Water-skiing and banana boating are available at Club Patara. Kalkan is a major diving centre, with several operators offering it nearby. We have stayed in the villa 3 times. We love stepping out of the terrace doors in the morning on to the terrace eating breakfast over looking the Kalkan Bay . There are so many places to soak up the sun . Hidden away terraces and pools all with a heavenly views of the sea and Kalkan where we spotted Turtles and fish swimming freely . So We can’t wait to go back again. Fabulous spacious villa in a prime position. Fabulous spacious villa in a prime position in the stunning Patara Prince resort. This is our second holiday at the Patara Prince and our first at this lovely villa. The villa itself is very well maintained and furnished. It has a lot of personality. Local assistance and supervision is available and when we had a small request contatced the owner and it was rapidly solved. The villa is located very close to the sea. It has a nice garden, good wifi, views of the bay are stunning. The veranda catches the evening sun. We can recommend it to all. We are delighted you enjoyed the villa and your stay, and very pleased we were able to help with your request. 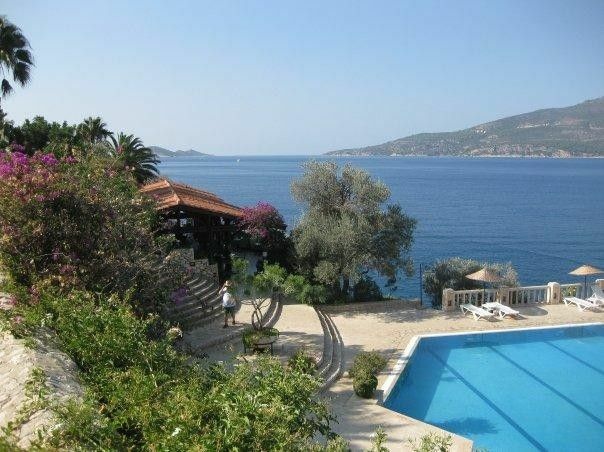 A lovely villa in an enviable sea facing position. The resort is lovely & well cares for to create a beautiful environment. The villa is extremely comfortable & well equipped. The main pools are sea water & the children's 'fun' pool is only open during the Turkish summer holiday - which it seems does not (always) correspond with the British half term(s). Points worth noting if you're going as a family. That said the main pool is wonderful & our children loved it. Kalkan is a fantastic resort. A 20-minute walk from the resort leads you to its' wealth of shops, restaurants & bars. All are child friendly - but be warned, it's a steep resort, though roof top restaurant owners will gladly help carry baby buggies upstairs. This was our second visit to Kalkan & our first to the Patara resort. It's safe to say we will gladly be visiting both again. I recently spent a week at this gorgeous villa with my husband, twin babies and my inlaws. We could not fault it. Patara Prince Resort is beautiful, and the villa is in the best spot of all, with beautiful views of the sea, Kalkan town, and the main swimming pool. Think we actually got some 'villa envy' out there. The villa was beautiful with a very well equipped kitchen. It was spacious and clean. It is full of modern amenities in a traditional setting. The photos are good, but it's even better when you are there! I am a total perfectionist, and spent ages looking for the perfect place to stay - and this was it! Once I had booked, there was a very efficient team of people helping to organise transfers to and from the airport, and hiring highchairs and cots etc. We even got a discount on all food and drinks on the resort, using the owners membership card. Kalkan, and Patara Prince are classy, peaceful locations - a beautiful way to spend a holiday. We are definitely planning a trip back next year. Thank you for such a positive review. We are delighted you loved the villa, the team, and had a great stay in Kalkan! We look forward to you staying at the villa again, and will try to make your stay as enjoyable and pleasant, and more if we can. The villa is located within the pedestrian Patara Club resort. A 25% deposit is required to confirm the booking. This is non refundable. The balance of 75% is due 8 weeks prior to departure. If departing within 8 weeks of booking 100% is payable at the time of reservation. The winter rates are set low because many of the Club facilities close in low season (restaurants, kids club and tennis courts). However, the weather is often mild and the local town is still fully operational.